Did you know you can buy Crown paint at amazon? I didn't until just now! 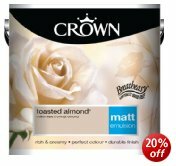 And there's 20% off their range of matt and silk emulsions from Crown as an introductory offer! You can browse the paint range here Crown Paint online at Amazon. Crown has been making paint for many years. All their Crown Matt and Silk Emulsions are Breatheasy 99% solvent free--virutally odour free, allowing you to paint your rooms and start using them sooner! Paint is cheap and effective at changing how your room looks. It's easy to paint! You just need brushes, a roller makes it quicker, and a ladder so you can reach the top of the walls. It's sensible to start doing round the edges with a brush and then fill in the colour. Read the instructions on the paint tin before opening it. Some paints need stiring and some don't! Amazon also sell Disposable Shoe Covers which can help you from walking paint on carpet in other rooms! They also have a massive range of brushes and rollers to make the job of painting easier. Don't forget if you're in rented accomodation to get permission in writing from your landlord before repainting!